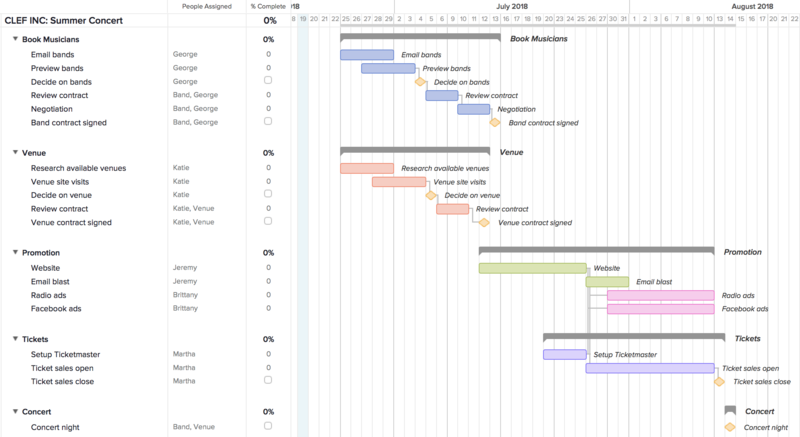 A gantt chart is simply a timeline view of your project. It’s a tool that helps you manage all of the different resources, people, and tasks along the way to accomplishing the goal of your project. Gantt charts may seem complicated at first, but we can start by breaking them down into 4 sections. Let’s take a closer look at each element of a gantt chart. A project is made up of several tasks, and related tasks can be organized into groups. You can see in this example that there are multiple groups of tasks such as Book Musicians, Venue, Promotion, and Tickets. Often your projects will have multiple tasks to manage, so this is an easy way to organize and group tasks together. You will also notice that the right-hand side of the chart has group and task bars that correspond to the group and task names. Each bar represents when the task will start and end. Gantt charts are especially useful for any project where you want to visualize how long your project will take. A milestone is an important goal, event, or deliverable in your project, such as a kickoff meeting or major deadline. Using milestones in your project plan can help you monitor progress and identify potential delays. In TeamGantt, milestones are signified by a gold diamond on the gantt chart and can be scheduled just as easily as tasks. A dependency links tasks together to ensure work gets done in the right order. For instance, in the example below, we created a dependency between Venue site visits and Decide on venue because we can’t make a decision until we’ve visited each venue. In TeamGantt, a dependency shows up as a light gray line connecting tasks on your gantt chart. 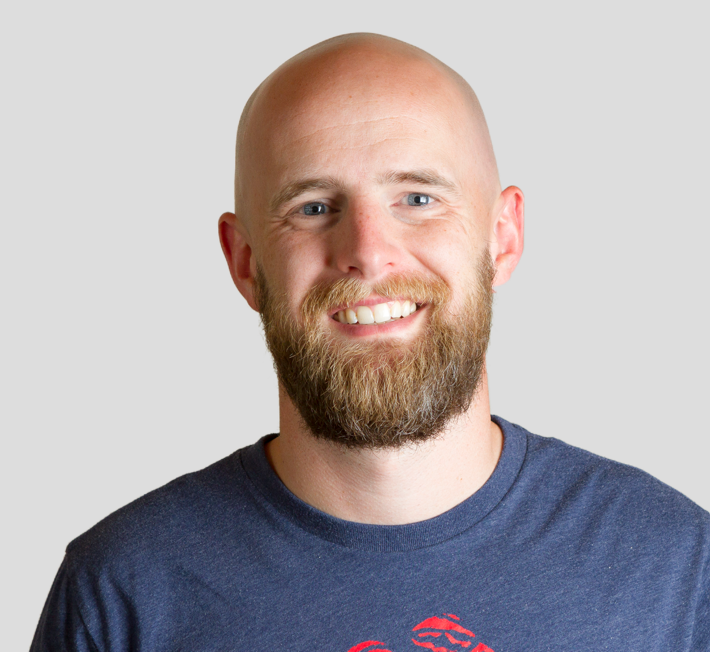 Ryan Carson was recently being interviewed about his highly successful startup Treehouse. 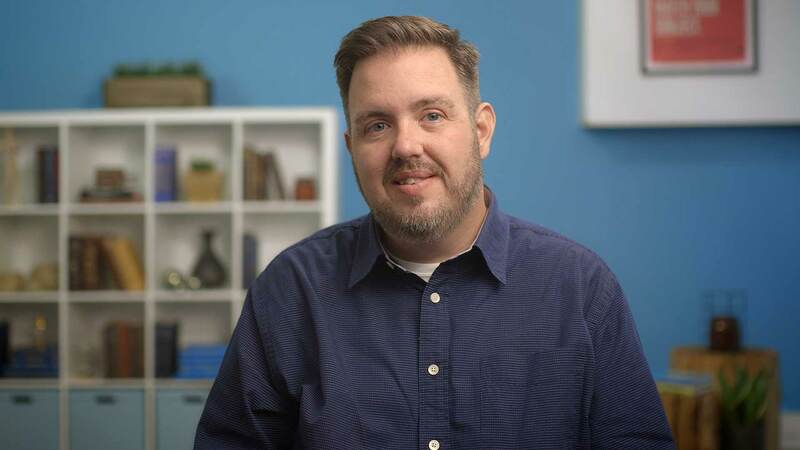 He discussed how beneficial dependencies are in TeamGantt because he could easily see what would happen if one task took longer than expected and how it affected the entire project. He was able to really get a grip on his project and keep it under control. Software developers frequently use gantt charts to manage their projects. This example shows a gantt chart for a software development project using the agile approach. Tasks have been organized into groups based on sprints, with milestones for sprint planning and deployment. Learn more about How to Use Gantt Charts For Your Agile Project. Construction project managers rely on gantt charts to manage moving parts across large projects. In this simple gantt chart example, each phase of the construction process has been broken down into its own group of tasks. Important planning meetings, contract sign-offs, and inspections are represented by milestones. Check out TeamGantt’s Construction Planning & Scheduling Software. Want to learn more? Watch this video on how to use a gantt chart. If you need an easy way to create a gantt chart, give TeamGantt’s online gantt chart software a try. TeamGantt enables you to build project plans in minutes and track progress in real time.